The page for Bob’s Steak & Chop House menu prices. Bob’s offers up a great steakhouse experience by serving prime steak and freshly prepared, signature side dishes. Bob’s only uses prime cuts of meat that are expertly grilled to customer’s request. Guests are treated like family and once seated, every table receives Bob’s famous pickles and a loaf of fresh, warmed bread. Every steak dinner plate receives a side of Bob’s glazed carrot. Guests can enjoy their meal accompanied by a vast selection of award-winning wines. Below are the latest Bob’s Steak & Chop House menu prices. Whether organizing a business function or celebrating a special occasion, Bob’s will provide personalized service to make your private event a success. Guests can expect superior service that includes a personal event planner, customized menu, and an award-winning wine list. Guests should check with the nearest Bob’s location for more information and room availability. 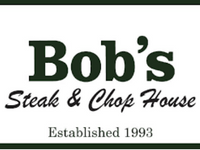 Bob’s Steak & Chop House was founded by Bob Sambol in 1993 in Dallas, Texas. Today, there 16 locations across the US including Texas, California, Tennessee, Arizona, Kentucky, and Florida. For more information about Bob’s Steak & Chop House, visit their official website. Are reservations required at Bob’s Steak & Chop House? Reservations are highly recommended at Bob’s Steak & Chop House. What is the recommended dress code at Bob’s Steak & Chop House? The recommended dress code at Bob’s Steak & Chop House is business casual attire. What are the hours of operation for Bob’s Steak & Chop House? Where is the nearest Bob’s Steak & Chop House? Guests can click here to find the nearest location.